A short annual up to 50cm tall. 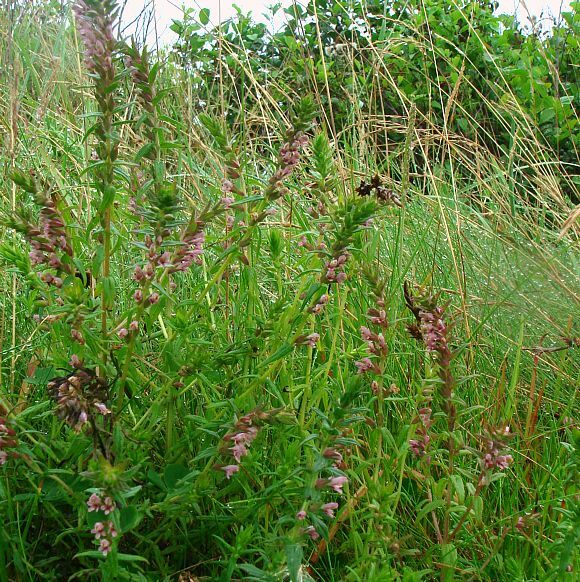 Grows in grassy and bare places such as beside farm tracks. The tallest and most upright specimens your Author has espied. Normally stoops over like this. 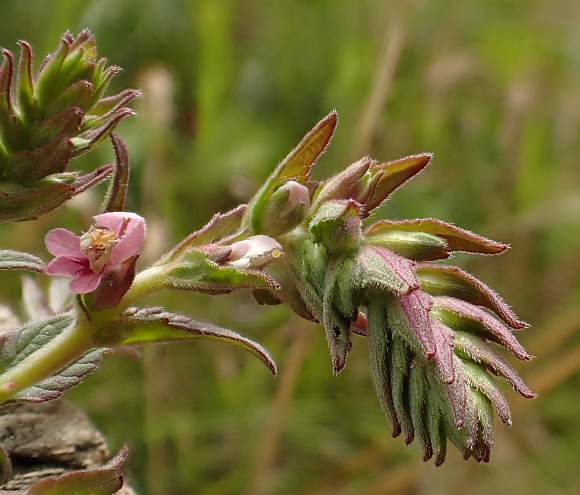 Green flattened-oval flower buds developing between tiers of leaves. 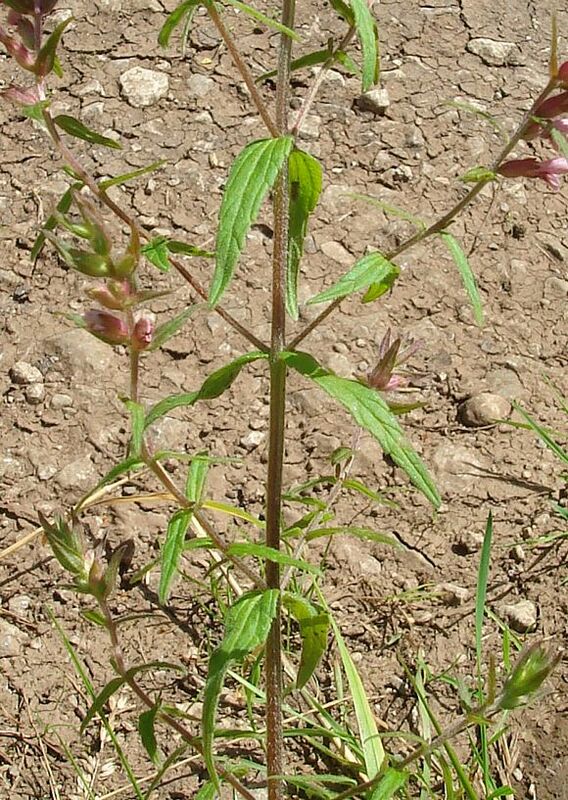 Leaves narrow and lanceolate in opposite pairs with few blunt teeth and few grooved veins. Flowers possibly in pairs some of the time? Sepal teeth long but blunt at the tip. 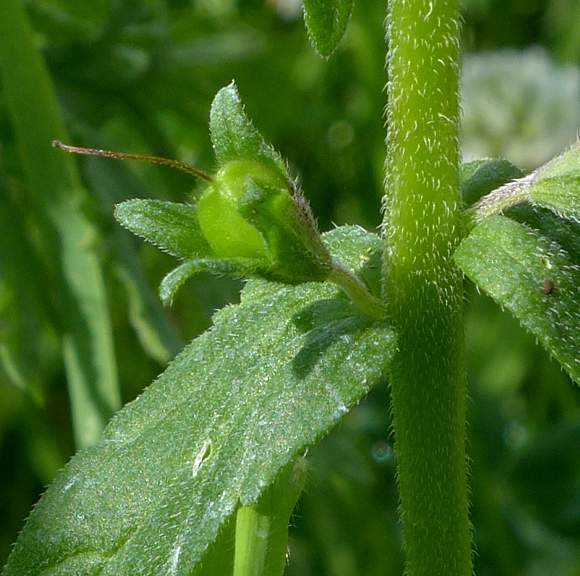 Spent flowers lower down have styles protruding from the fruit (here n by sepal tube). Lower lip is in three lobes. 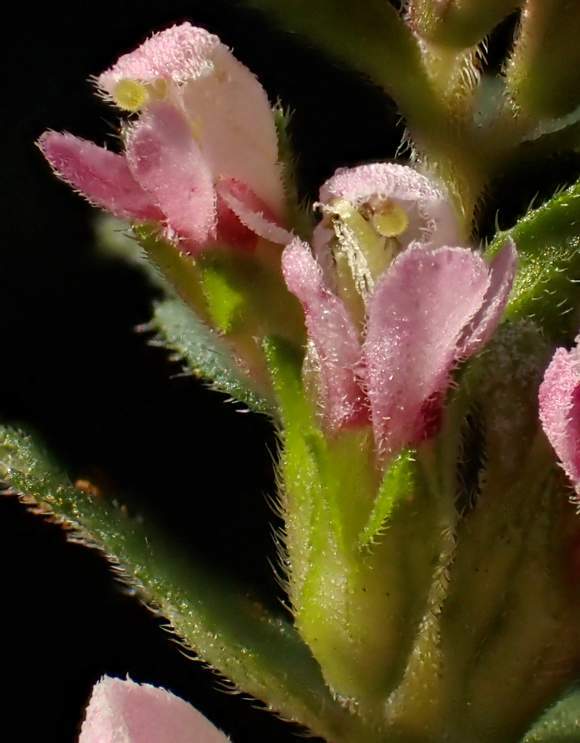 Pink style visibly slightly protruding just above lip of lowest flower, and just above that is a yellow anther at each tip of the two white stamens. Sometimes with the lower lip directed upwards and looking like dolfins clapping their flippers. Style and stigma becoming bold and protruding far out from the upper lip. 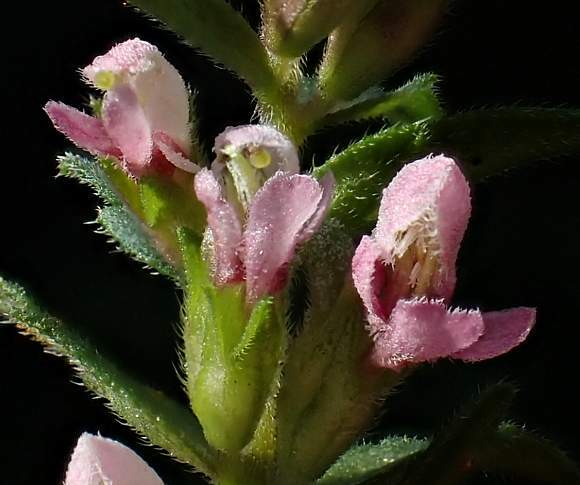 The petals have short straggly hairs. Two white stamens visible in upper lip. The style has a disc-shaped lemon-yellow stigma just under the upper lip. 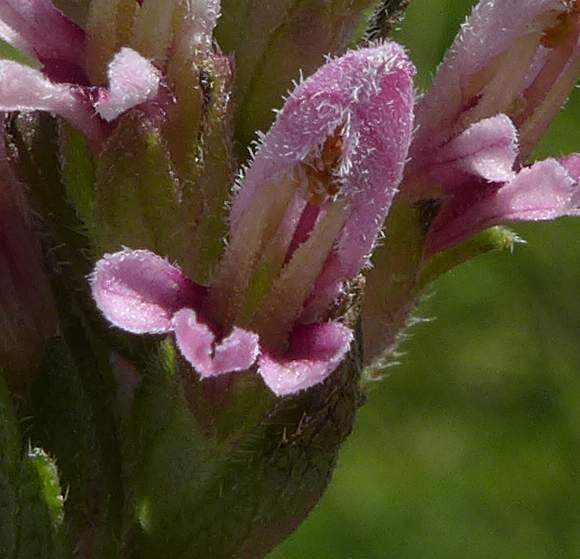 The beaked appearance of the flower resembles that of Yellow Rattle, but is pink and not yellow. Some leaves hairier than others. The fruit with remains of style sticking out. Short downwardly-directed hairs on stem as on leaves. Leaves attached directly to stem without stalk. Developing fruit still has style on end here and is green at the moment. There are 4 sepals, more plainly seen when in fruit. Fruit is as hairy as are the sepals, leaves and main stem, but those on main stem angled downwards. Now browned styles still attached to tip of prolate spheroidal fruit. A differing sub-species. 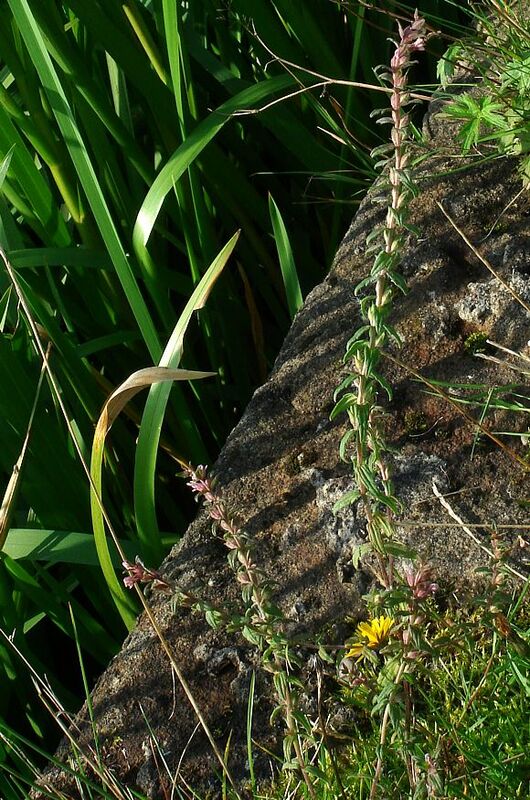 Leaves in opposite pairs, the lower are longer, less hairy, less toothed and narrower than ssp. vernus above. It is possible this is the sub-species ssp. serotinus, which is up to 50cm tall. All the other photos are probably ssp. vernus which is shorter, only reaching 25cm. 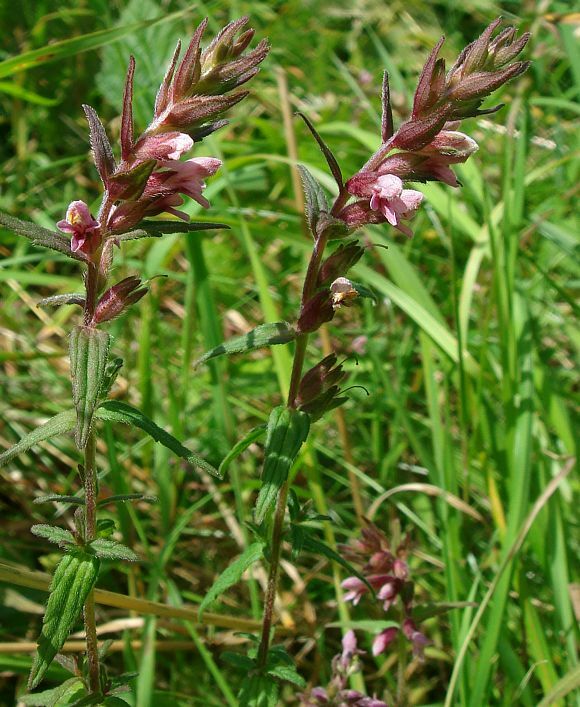 Some similarities to : some Cow-wheats such as Common Cow-wheat (Melampyrum pratense) but those flowers are yellow and not as closely bunched-up. 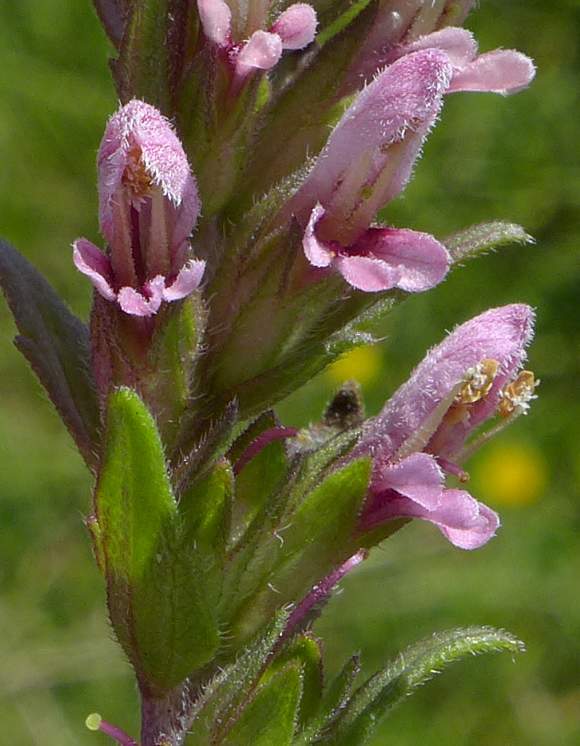 Slight resemblance to : Alpine Bartsia (Bartsia alpina) but that has purple-coloured flowers. This is a Hemi-Parasitic plant, meaning that it relies on obtaining some of its nutrients from the roots of nearby plants, usually grass. 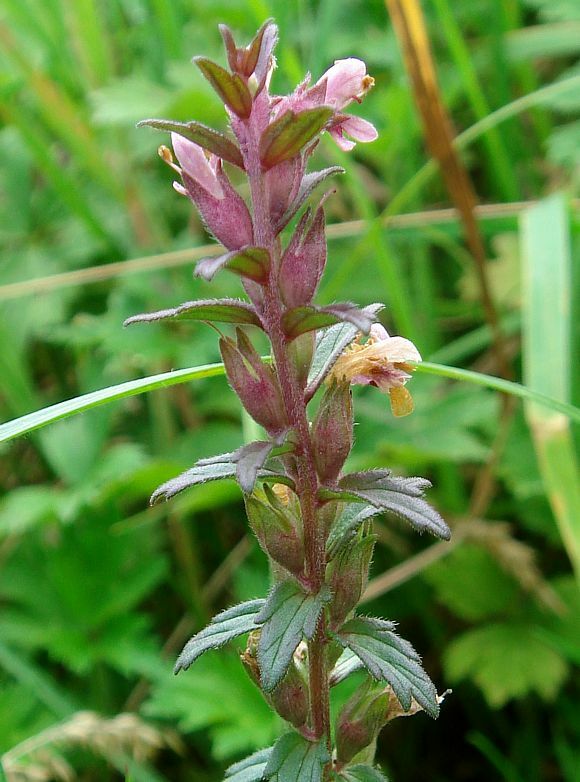 The flowers themselves have a beaked appearance that resembles those of Yellow Rattle which is another hemi-parasite but the flowers of Red Bartsia are smaller. 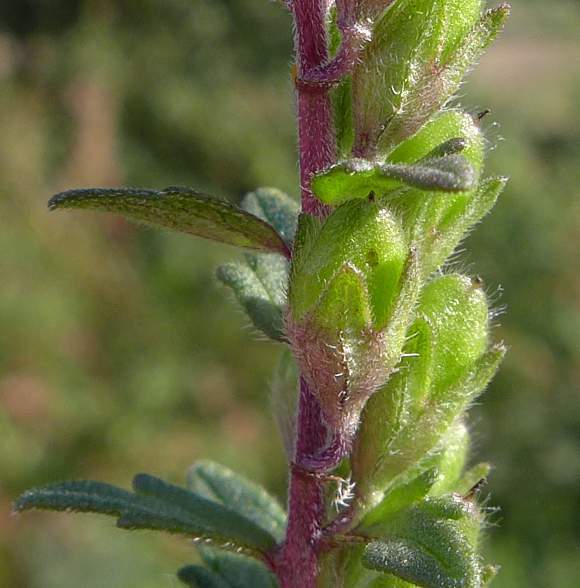 Un-branched examples of Red Bartsia are starved of nutrients, when fully enriched it is branched. The scientific binomial name vernus (which means spring) is a misnomer, it does not flower in the spring, but in summer (aestival) or in autumn, depending upon sub-species, of which there are three (perhaps four). 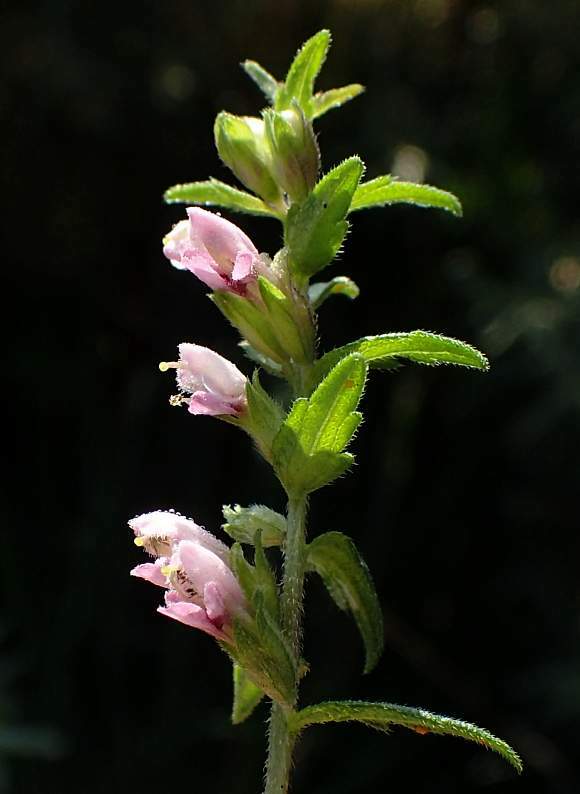 Red Bartsia (Odontites vernus ssp. vernus). Flowers in summer. Shortish to 25cm and stooping when young. Inhabits grassy places, arable land and waste ground. Number of branches vary between 1 to 4, sometimes none and held at <51° to the main stem. 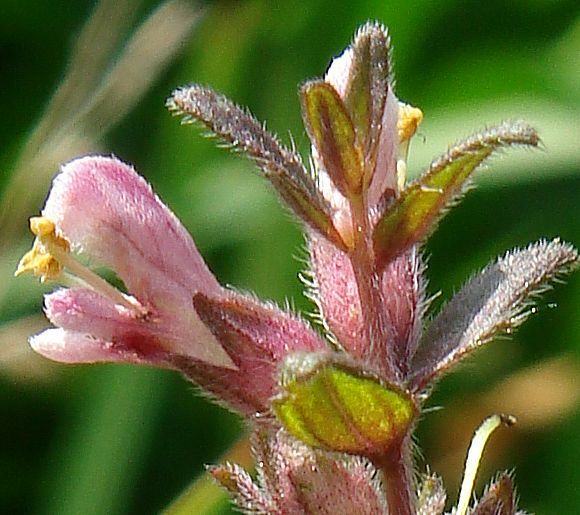 The lowest flower occurs at the 4th - 9th node. Between none to 1 pair of intercalary leaves. 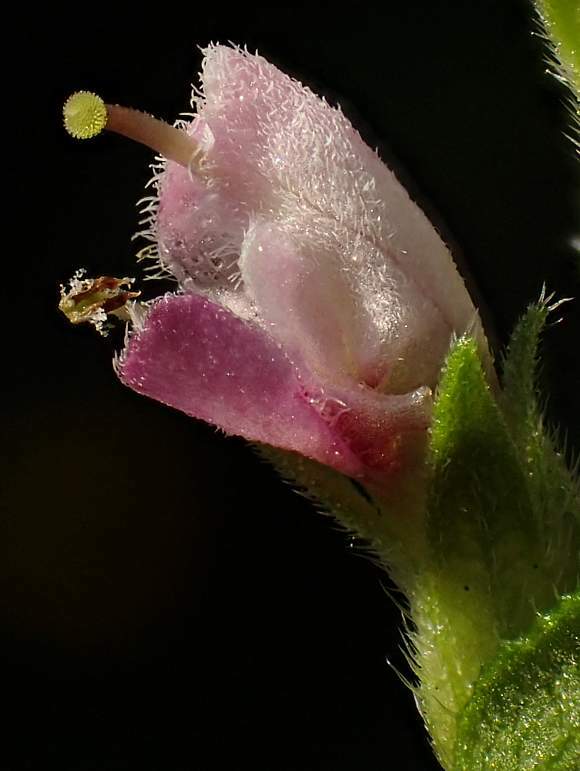 Calyx teeth as long as tube, Style protruding from corolla at the height of pollen-shedding season (anthesis). 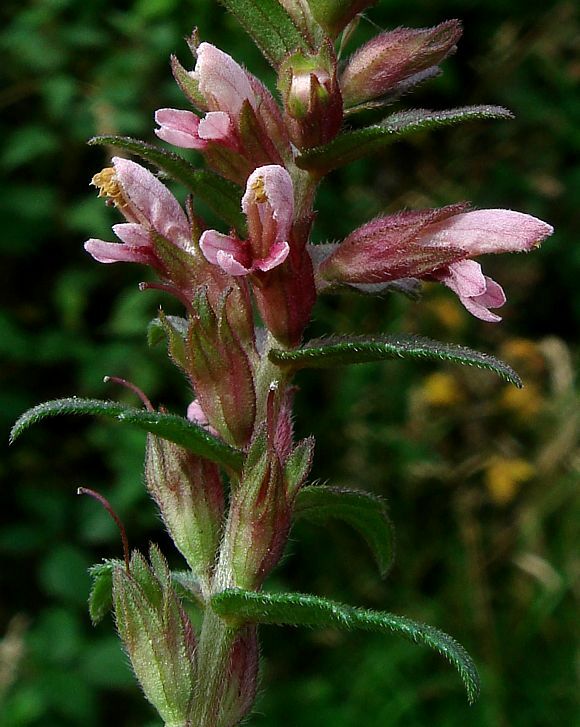 Red Bartsia (Odontites vernus ssp. serotinus). Flowers in autumn. Twice as long, up to 50cm and more upright. Habitation the same as ssp. vernus, but also (as with ssp. litoralis) in maritime locations. Number of branches vary between 2 to 8, sometimes none and held at >49° to the main stem. The lowest flower occurs at the 8th - 14th node. Between 2 to 7 pairs of intercalary leaves. 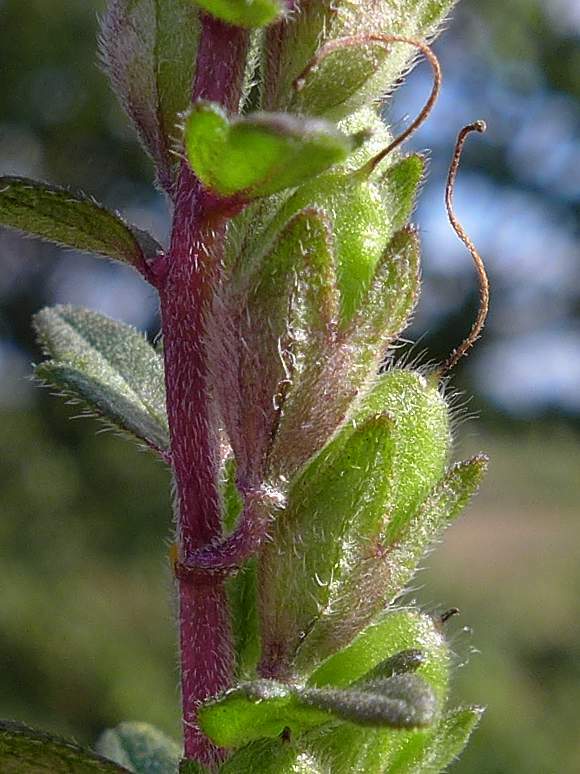 Red Bartsia (Odontites vernus ssp. litoralis). It is a medium rare [RR]. Flowers in autumn. [A disputed sub-species which, along with ssp. pumilus, some say does not exist]. Number of branches vary between 1 to 4, sometimes none and held at <51° to the main stem. The lowest flower occurs at the 4th - 8th node. Between none to 1 pair of intercalary leaves. Calyx teeth shorter than tube. Style shorter than upper lip of corolla at the height of pollen-shedding season (anthesis). The existence of the latter sub-species, ssp. litoralis, is disputed, some say it does not exist [along with ssp. pumilus which is not listed above]. It is not known which sub-species the above photos represent, but is likely that most are of ssp. vernus, with the tallest and most obviously branched being ssp. serotinus.